Nansen Center scientists Drs. 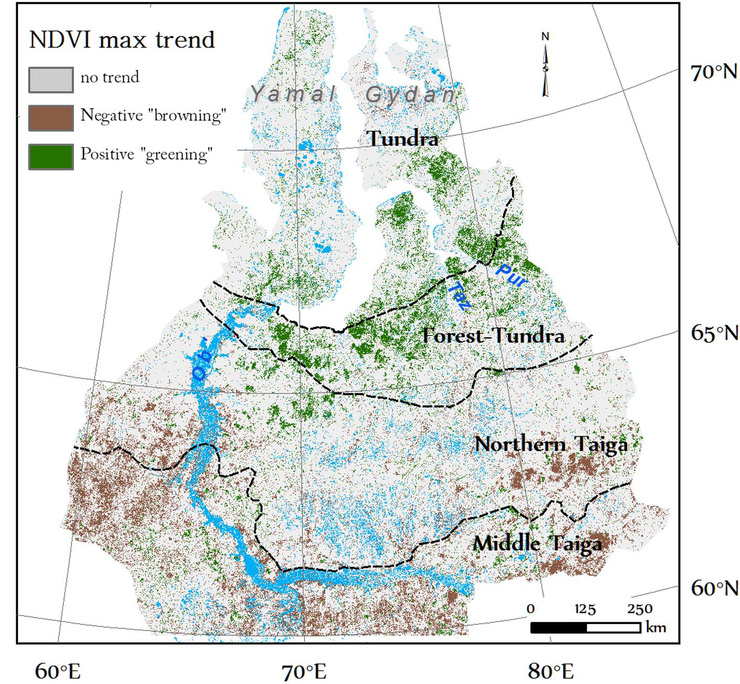 Victoria Miles and Igor Esau have published the paper Spatial heterogeneity of greening and browning between and within bioclimatic zones in northern West Siberia in Environmental Research Letters. The research is a part of the project HIARC: Anthropogenic Heat Islands in the Arctic: Windows to the Future of the Regional Climates, Ecosystems, and Societies funded by the Belmont Forum through the Norwegian Research Council of Norway. 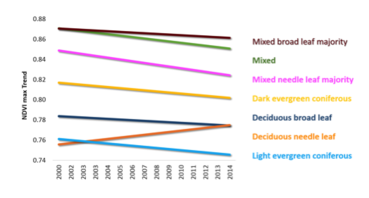 Statistically significant trends of greening (positive trend) and browning (negative trend) (p &lt;0.05).Miles and Ezau have studied a 15-year record (2000-2014) of vegetation index data from the Moderate Resolution Imaging Spectrometer (MODIS) satellite sensor. They find spatial heterogeneity in the vegetation trends, and contrasting trends both between and within bioclimatic zones (biomes). A key finding of the research is the identification of contrasting trends for different species within the same bioclimatic zone. The most interesting observation is that larch-dominated (Larix) forest is only the forest type in northern West Siberia showing a positive “greening” trend, according to the study of 15 years record of a vegetation index based on satellite images. 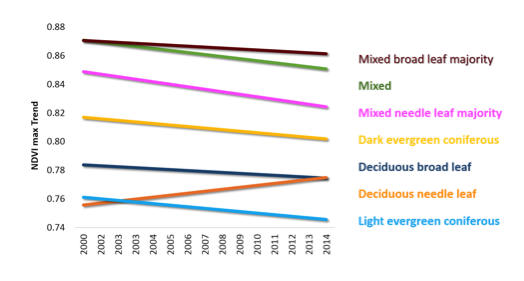 Among the various types of forest stands growing close to each other, only the Larix – which is a deciduous needle-leaf conifer – shows a positive change while the other six types show negative trends (see graph). The scientists observed prominent “browning” in evergreen coniferous forest with dark (Picea abie, Picea obovata) or light (Pinus sylvestris) evergreen and evergreen-majority mixed forests. Moreover, declining spruce and pine productivity appears to be the major driver of the downward trend in the West Siberia taiga zone. The general trend for the northern West Siberia found by the study is an increase in the tundra and a decrease in the taiga zone (see map). The study shows that greening in the tundra is highly fragmented and overlain with patches of browning and to a large degree could be associated with different local disturbances. 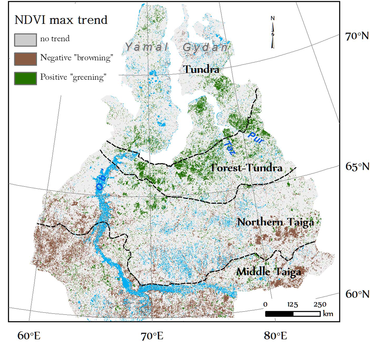 NDVImax trend for different forest types in northern West Siberia.The observed contrasting trends for different species within the same bioclimatic zone highlight the large spatial–temporal variability in tree growth responses to climate change in northern areas. The reactions are determined by limiting factor of plants grow inherent for particular biome. Tree species play a key role, providing habitat, food or mutualisms with many animals, fungi, microorganisms, and other plants in addition to other ecosystem services and resources for human use. Changing species distribution and biodiversity will have important biological, ecological and social consequences. Citation: Victoria Miles and Igor Esau, 2016: Spatial heterogeneity of greening and browning between and within bioclimatic zones in northern West Siberia. Environ. Res. Letter 11 (2016) 115002.